Denomination : AE-3/4. Mint : SMKS (Cyzicus, 6th officina). Date : This type was issued between AD 336 and 337. Size : 15.5 x 16.3 mm. Weight : 1.81 grams. Reference : Sear-3887, RIC VII, page 659, #122. 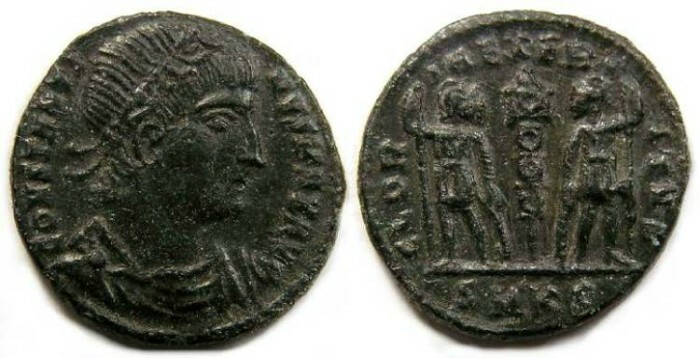 Obverse : Head of Constantine right, with CONSTANTINVS MAX AVG around. Reverse : Two soldiers standing either side of a standard, with GLORIA EXERCITVS around, with the mint mark SMKS below.